The bottom of a person’s foot grips the floor for balance, and the action force and action moment work at the foot bottom when he maintains posture and when he moves. They are important indices in the evaluation and the medical attentions of standing pose balance and gait disturbances. A lot of equipment to measure the floor reaction force have been researched. However, no floor reaction force meter exists that can measure distribution information force in three directions. This paper aims at the development of a system that can measure the planter pressure that exists from a measurement instrument and that can measure the planter pressure distributed 6 × 4 three axis force sensors and software that displays and preserves the output of the sensor element. A time change of force that worked at the foot bottom is sought as a vector by outputting each sensor element. Moreover, an action vector is three dimensionally displayed whose data can be intuitively understood. 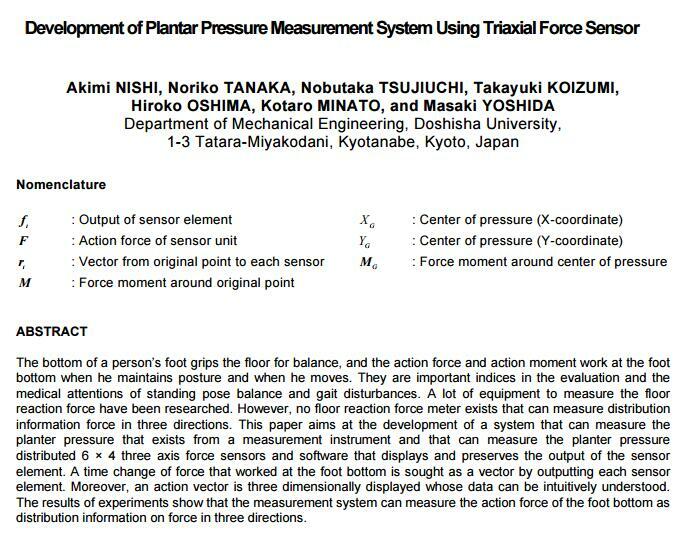 The results of experiments show that the measurement system can measure the action force of the foot bottom as distribution information on force in three directions.